Virtual reality is an artificial environment that is created and maintained by a computer and that is at least partly shaped and determined by the user. A virtual reality system allows the user to "leave" the real world and step into a world whose sensory inputs (sights, sounds, smells, etc.) are provided not by natural objects but by computer-created means. The things that happen in that virtual world can then be manipulated to a large extent by the user. In its most basic form, virtual reality systems consist of a computer and software—known as the reality engine—and input and output sensors. A sensor is a device that responds to some physical stimulus. A human eye, for example, is a sensor that responds to light rays. In standard computer technology, input devices are the familiar keyboard, mouse, knobs, and joysticks; output devices include the printer and video display. Virtual reality input/output devices include head- and earmounted equipment for hearing and seeing and gloves for controlling the virtual world. The fourth "component" is the user, who directs the chosen environment and reacts to it. The reality engine. The reality engine employs both computer hardware and software to create the virtual world. Reality engines are based largely on the same components that make up a personal computer (PC), although much more computing power is required for the reality engine than is available in a standard PC. One key to virtual reality is creating a world that appears real. The images created by the computer and software are extremely complex compared to the relatively simple line-based graphics associated with computer games. Virtual reality images are made with tiny dotlike segments of a picture known as pixels, or picture elements. Each pixel itself is made up of hundreds of thousands of dots. The more pixels there are per inch, the better or more realistic the image will be. Ergonomics: The study of the way humans and objects interact with each other. Haptic: Relating to the sense of touch. Light-emitting diode (LED): A device made of semiconducting materials that emits light when an electric current is applied to it. Liquid crystal display (LCD): A way of displaying visual information by using liquid crystals that emit light when exposed to electric current. Pixel: One of the small individual elements of which a visual image consists. Reality engine: The hardware and software used in virtual reality systems. Virtual: Something that is representative or the essence of a thing but not the actual thing. Creating realistic images that can be manipulated is known as realization. These images can be either opaque, in which all the viewer sees is the virtual world, or see-through, in which the virtual image is projected or superimposed onto the outer world. Sound enriches the virtual world. The experience of soaring through the air in a simulated cockpit is more realistic if the user hears the roar of the engines. Sound also enhances participation in the virtual world by providing the user with audio cues. For example, the user may be directed to look for the virtual airplane flying overhead. To incorporate the total experience, the reality engine also may use haptic enhancement. Haptic experiences are those that involve the participant's senses of touch and pressure. Haptic cues, however, are complex and expensive and have been used primarily for military and research applications. Headsets. Head-mounted display (HMD) units use a small screen or screens (one for each eye) that are worn in a helmet or a pair glasses. Unlike a movie, where the director controls what the viewer sees, the HMD allows viewers to look at an image from various angles or change their field of view by simply moving their heads. HMD units usually employ cathode-ray tube (CRT) or liquid crystal display (LCD) technology. CRTs incorporate optic systems that reflect an image onto the viewer's eye. Although more bulky and heavy than LCD displays, CRT systems create images that have extremely high resolutions, making a scene seem that much more realistic. In addition, CRT images can be semireflective, allowing the viewer to see the outside world as well. Such units have practical applications since the user can operate a machine or other device while viewing the virtual world. Although LCD technology has lagged behind CRT in picture quality, LCD systems are slimmer, lighter, and less expensive, making them better suited for home use. These units use liquid crystal monitors to display two slightly different images that the brain processes into a single three-dimensional view. Initial efforts to market this technology to home users failed because of poor LCD image quality. But rapid advances in LCD technology have improved the images, and higher quality LCD-based units have become available for home use. Audio units. Sound effects in virtual reality rely on a prerecorded sound set that is difficult to alter once the reality engine begins to generate audio. The audio portion of virtual reality is transmitted through small speakers placed over each ear. Audio cues may include voices, singing, the sound of bubbling water, thudlike noises of colliding objects—in short, any sound that can be recorded. Three-dimensional (or omnidirectional) sound further enhances the virtual reality experience. Sounds that seem to come from above, below, or either side provide audio cues that mimic how sounds are heard in the real world. Three-dimensional sound is achieved through the use of highly complex filtering devices. This technology must take into account factors like interaural time difference (which ear hears the sound first) and interaural amplitude difference (which ear hears the sound louder). The most complex human hearing dynamic is called head-related transfer functions (HRTF). HRTF accounts for how the eardrum and inner ear process sound waves, taking into consideration the various frequencies at which these waves travel as well as how waves are absorbed and reflected by other objects. HRTF audio processing enables the listener not only to locate a sound source but also to focus in on a specific sound out of a multitude of sounds, like distinguishing the call of a hot dog vendor out of a noisy crowd at a baseball game. Gloves. Gloves in virtual reality allow the user to interact with the virtual world. For example, the user may pick up a virtual block, turn it over in a virtual hand, and set it on a virtual table. Wired with thin fiberoptic cables, some gloves use light-emitting diodes (LEDs) to detect the amount of light passing through the cable in relation to the movement of the hand or joint. 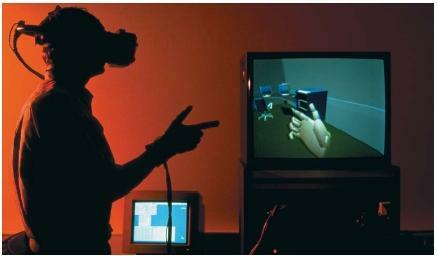 The computer then analyzes the corresponding information and projects this moving hand into the virtual reality. Magnetic tracking systems also are used to determine where the hand is in space in relation to the virtual scene. Some gloves use haptic enhancement to provide a sense of touch and feel. In haptic enhancement, the reality engine outputs the tactile experience, which may include force, heat, and texture. Tactile experiences are created by remeasuring a pattern of forces, which is programmed into the reality engine and then relayed back to the user when the appropriate object is touched. Virtual reality gloves may use either air pressure (such as strategically placed inflated air pockets in the glove) or vibrating transducers placed next to the skin (such as a voice coil from a stereo speaker or alloys that change shape through the conduction of electrical currents) to simulate tactile experience. Tools under development. Many other virtual reality tools are in the phases of research and development. Remote control robotic or manipulator haptic devices are being tested for industry and medicine. Special wands with sensors, joysticks, and finger sensors such as picks and rings will eventually be as common to virtual reality technology as microwaves are to cooking. The technology to control the virtual world through voice commands also is rapidly advancing. The potential for virtual reality as an entertainment medium is apparent. Instead of manipulating computerized images of two boxers or a car race, the virtual playground allows the user to experience the event. Disney World's Epcot Center houses a virtual reality system that propels the user on a magic carpet ride like the one featured in the popular animated film Aladdin. Although most entertainment applications are primarily visually based, virtual reality players of the future also may experience a variety of tactile events. For example, in a simulated boxing match, virtual reality users would bob and weave, throw and land punches, and—unless they were very adept—take a few punches themselves. McDonnell-Douglas Corporation is using virtual reality to explore the use of different materials and tools in building the F-18 E/F aircraft. The study of people in relation to their environments, also known as ergonomics, also may be revolutionized by trials in cyberspace. Engineers at the Volvo car company use virtual reality to test various designs for the dashboard configuration from the perspective of the user. In medicine, virtual reality systems are being developed to help surgeons plan and practice delicate surgical procedures. Philip Green, a researcher at SRI International, is developing a telemanipulator, a special remote-controlled robot, to be used in surgery. Using instruments connected to a computer, doctors will be able to perform an operation in cyberspace, while the computer sends signals to direct the telemanipulator. Virtual reality may even have applications in psychiatry. For example, someone with acrophobia (a fear of heights) may be treated by practicing standing atop virtual skyscrapers or soaring through the air like a bird.